97.4% of Lots Sold, Strong Demand for Wines from Bordeaux, Burgundy, Spain and California. 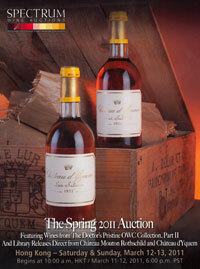 Spectrum Wine Auctions, one of the new leading players in fine and rare wine auctions, sold an impressive 97.4% of the 1,752 lots offered at its massive two-day Spring 2011 Live Auction, held on March 12 and 13 at The Sheraton Hong Kong Hotel & Towers. This was Spectrum Wine’s sixth live sale since launching in July 2009, and their largest sale to date, realizing $5,525,121 ($43,044,938 HKD). The packed bidding room demonstrated enthusiasm for Lafite in particular, as the 137 lots listed in the sale sold for an impressive $1.2 million, proving the Chateau’s strength with buyers in Asia and around the world. Interest and demand for Chateau Mouton Rothschild also continued its upward trend with especially strong showings from the consignments purchased directly from the Chateau’s cellars. Burgundy’s ascent in popularity among Asian collectors persisted with Domaine de la Romanee-Conti fetching astronomical sums, especially in larger format, and a Magnum of 1978 H. Jayer Richebourg selling for $23,900, nearly doubling the U.S. auction record. On a more surprising note, cult wines from California sold for some of the highest prices realized in years, as eager bidders competed for Scarecrow and Screaming Eagle. Other highlights included consignments purchased directly from the cellars of Chateau d’Yquem and Compania Vinicola del Norte de Espana, as well as the second installment of The Doctor’s Pristine OWC Collection, a staggering consignment with impeccable provenance. A standing room only crowd of collectors from Hong Kong, China and the United States gathered at The Sheraton Hong Kong Hotel & Towers to participate at the auction in person. The live sale also attracted online bidders from around the world via Spectrum Wine’s innovative real-time bidding software and live streaming video featuring auctioneer Richard Brierley, current Head of Fine Wine at Vanquish Ltd., and previous Head of North American Wine Sales at Christie’s. Southern California collectors gathered for an invite-only dinner at Charlie Palmer at Bloomingdale’s South Coast Plaza in Costa Mesa, Calif. where they watched live video of the sale on a large screen TV and placed secure bids on a series of bidding terminals.